You know those moments, the ones full of wonder and awe? The moments when you feel both incredibly small and remarkably lucky to see and experience and know the things you do? 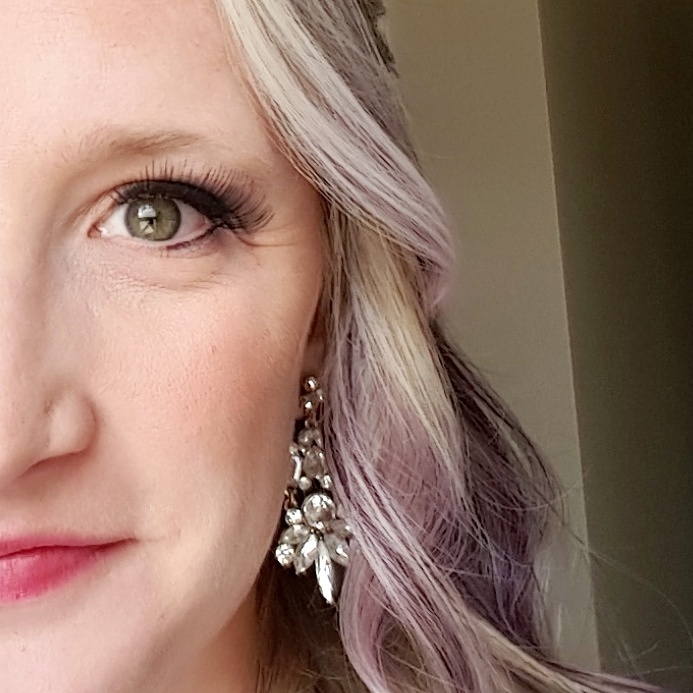 I know many people feel those moments often with their children, I know I do sometimes with brand new babies or a particularly delightful moment with a niece, nephew, or one of my stepkids. More often than not, however, I feel those moments in the great outdoors, exploring mountains and wild places where it is quiet and full of the Great Everything. 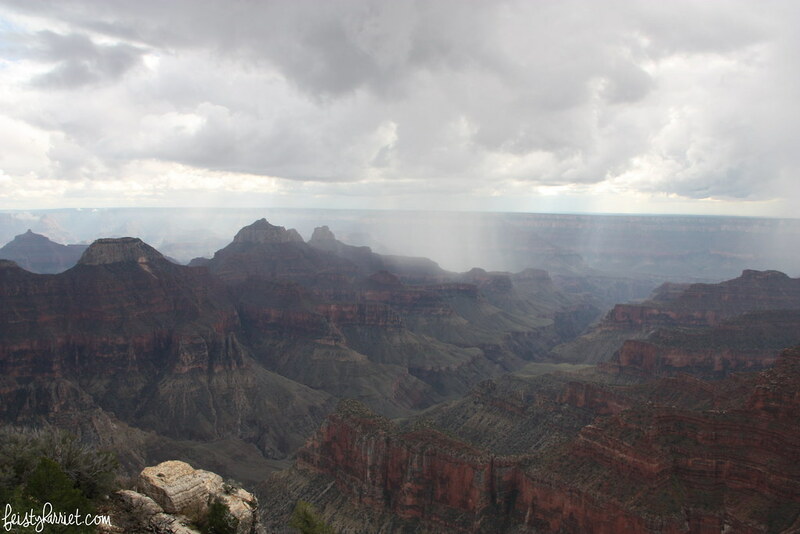 On one of the many trips between Salt Lake and Arizona last year I stopped at the Grand Canyon and watched a storm roll over the canyons and ridges. It was mostly quiet, a few off-season tourists, and I could smell the rain and feel the strength of the storm in the wind. It was one of the most delightful moments, the kind that fill you up to your brim and let all the heart-healing goodness slop down your sides. Sometimes I forget how much I desperately need moments like that, the ones that heal your soul and give you a little push in the right direction. Whether those moments are with mountains or babies I want to actively seek those opportunities this year. 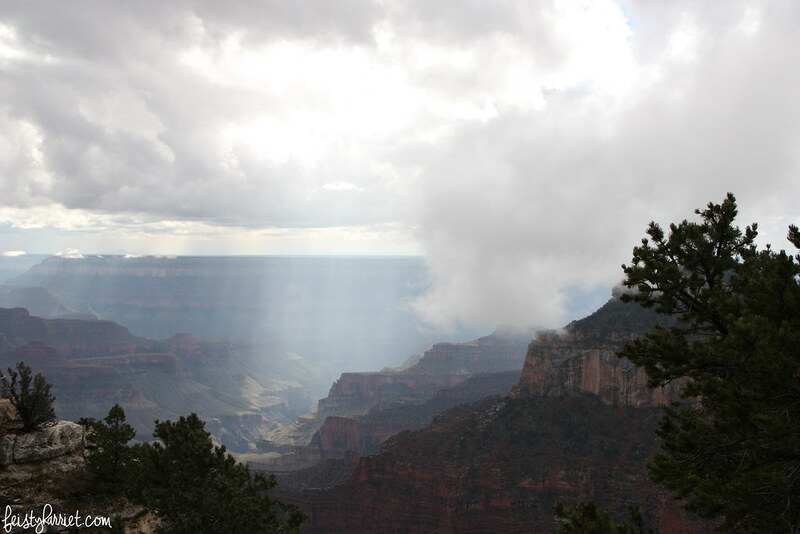 And if that means a solo trip back to a lonely spot in the Grand Canyon, so be it. Six months ago my sweetheart moved 700 miles away to the Valley of the Sun, we’ve each made a bunch of trips back and forth for weekend visits, but this particular weekend we decided to meet halfway and do a little exploring near the Four Corners area (Utah, Colorado, New Mexico, Arizona). 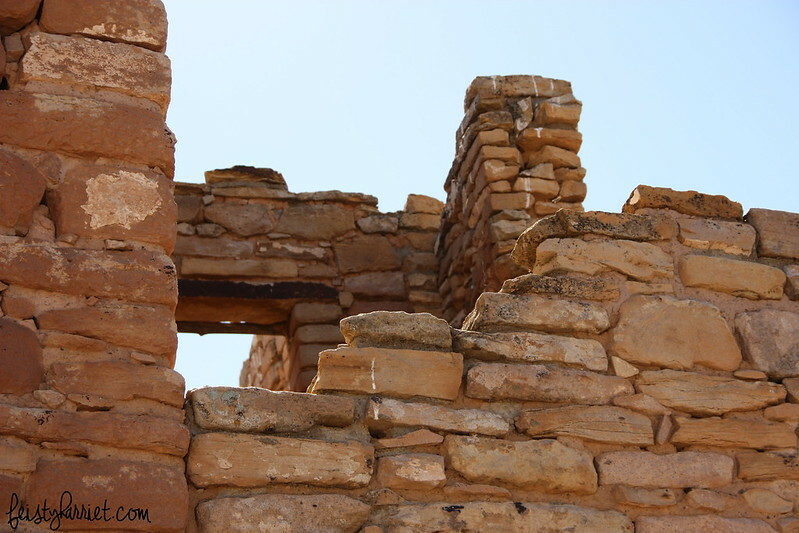 A few years ago we visited Mesa Verde National Park and explored it’s fabulous ruins of the ancient Ancestral Pueblans who lived there 700 years ago. 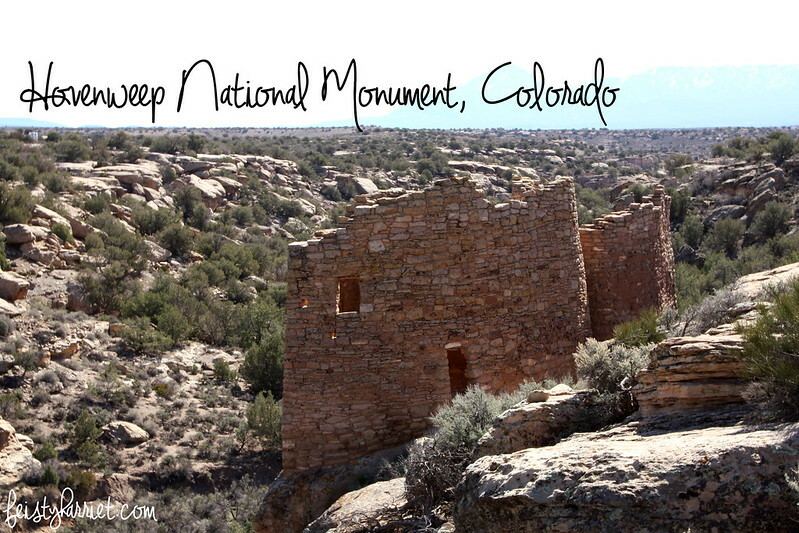 Mesa Verde has a lot larger budget and considerably more well-preserved ruins, due both to protection inside the cliffs and a lot of excavation and archaeological studies. 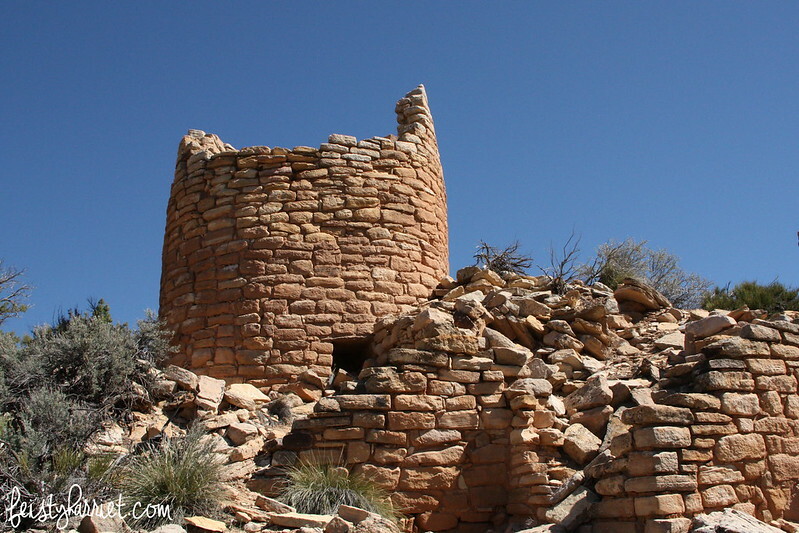 Hovenweep National Monument–Hovenweep means deserted valley–is from the same time period and the same people. 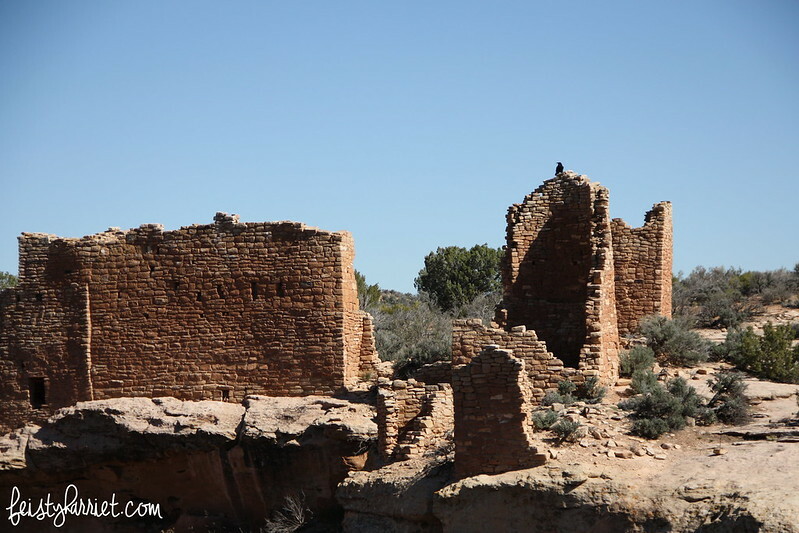 Built almost a thousand years ago and abandoned by about 1,300 A.D., these sandstone block homes are incredibly impressive with multiple rooms and many with two or more stories, and windows and what I assume were thatched roofs. 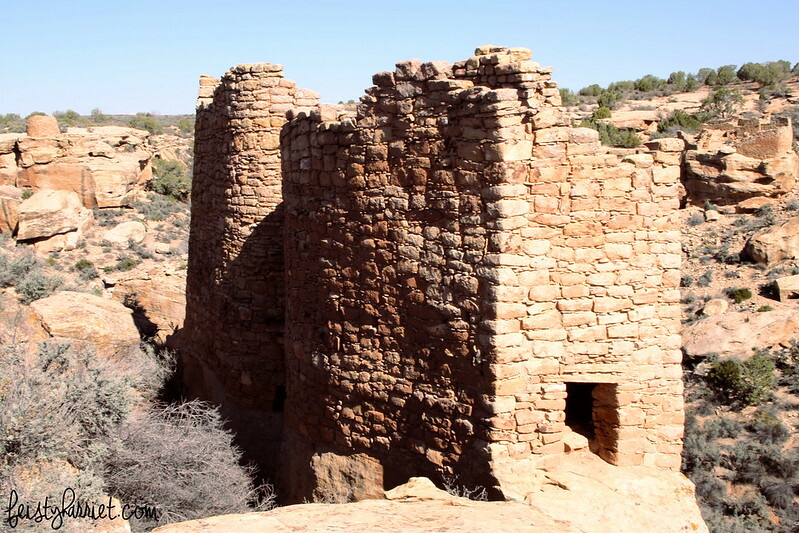 To date, no one can determine why exactly the Ancestral Pueblans left their communities in the Four Corners area (including the Mesa Verde peoples), but they do know that the traveled south-east and settled in central New Mexico. 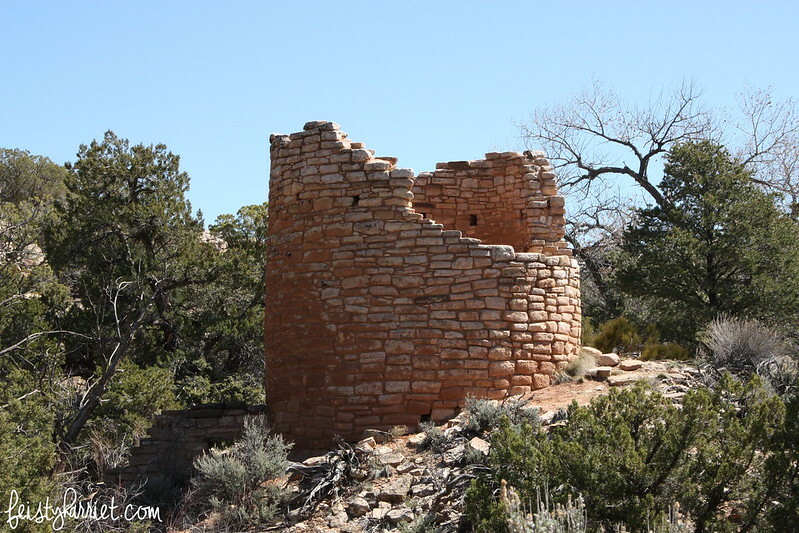 From the visitor center there is a easy 2-mile loop that takes you along the rim of a small box canyon with clusters of homes along both rims and the bottom. The spring they used for water has long since dried up, but as many as 2,500 people lived here at once, the canyon echoing with the shouts of children and the noises of village life. 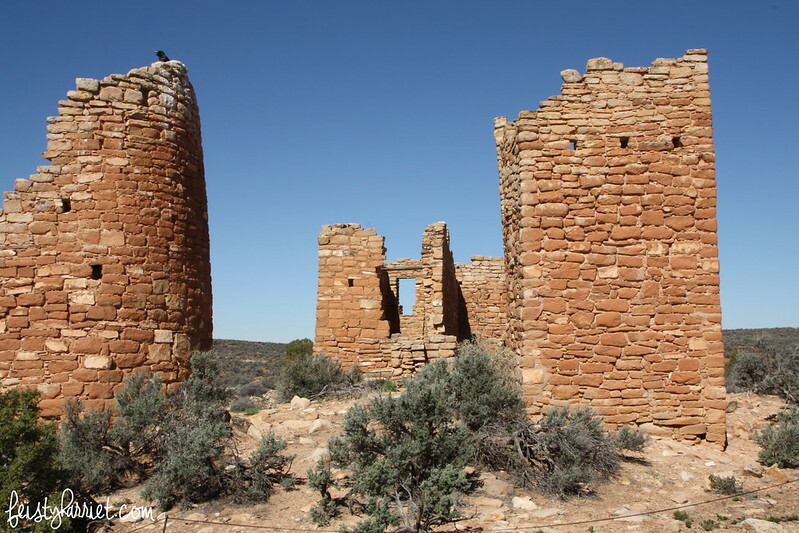 These ancient peoples practiced dry farming on the mesa top surrounding their home growing squash and beans and corn. 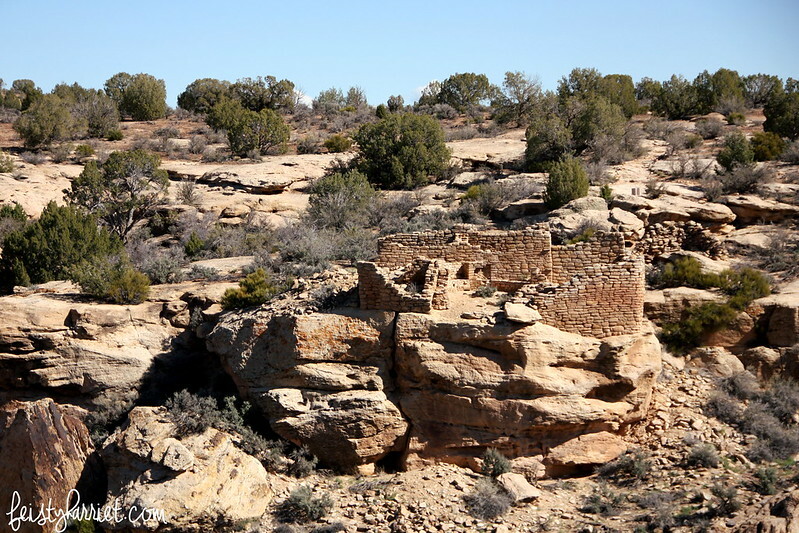 Unlike Mesa Verde, you cannot get very close to the ruins, you cannot tour any of the homes or even walk inside them. However, it was fascinating to see the larger sandstone blocks held together with adobe and smaller stones filling the gaps; there were purposely square buildings, and round towers, and ingeniously built structures that used boulders as walls, building their homes nestled right next to a cliff or giant rock. 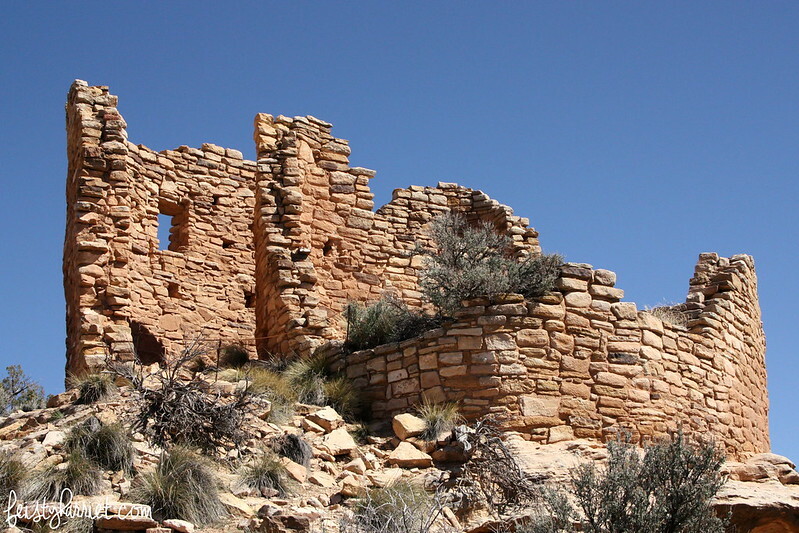 A few miles away from Hovenweep proper is a singular set of ruins called Cutthroat Castle with 5 or 6 structures in impeccable condition. Now, it’s quite a hike to get there from the main road, or a made-me-very-nervous 4WD only road (Blue Eyes is the driver for all such excursions that require 4WD and he wasn’t nervous at all, but I was). Cutthroat Castle was gorgeous, I loved that there wasn’t anyone else there, and I loved that we could get a lot closer to the ruins (we didn’t touch anything, just looked, and I took a million pictures, per usual). 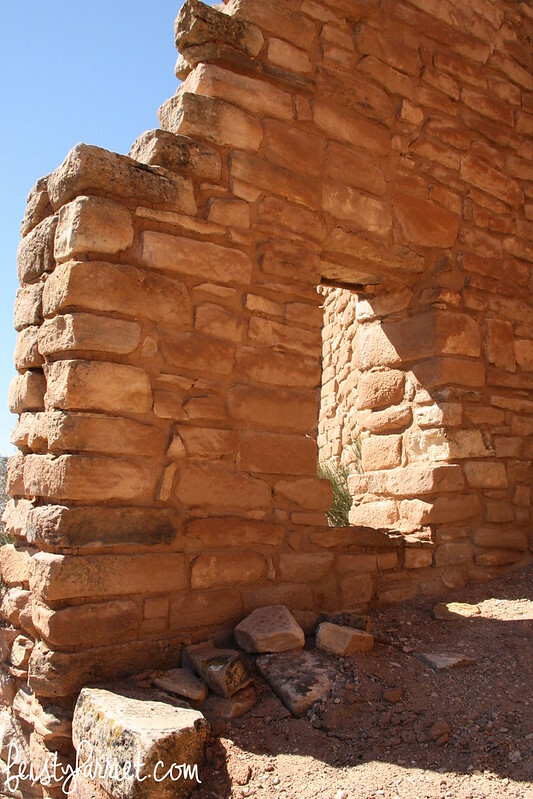 If you go: there are bathrooms at Hovenweep, but no water for purchase and no other amenities. There is very little shade on the short trail and a lot of blazing sun, so bring a hat and sunscreen and plenty of water. If you have a camera lens with a serious zoom I’d recommend that as well. I know many of you are still buried in winter, and I don’t mean to rub it in, but except for a day here and there we’ve been experiencing spring-like conditions since January. This is kind of good (yay! Spring!) and also really really scary (WHAT HAPPENED TO THE SNOW?!?!). I imagine our wildfire season will be worse than your snow season, so don’t throw stones at me quite yet. 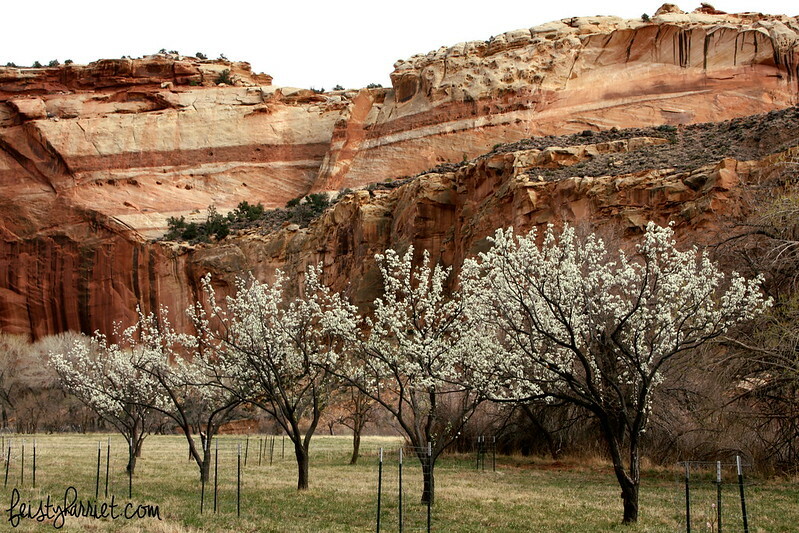 That being said, last weekend while I was taking the very long way home from a weekend with my sweetheart, I kind of accidentally stumbled upon one of the most beautiful places I didn’t know existed; the fruit orchards of Capitol Reef National Park. Okay, I guess technically I did know they were there, but I did not realize how stunningly beautiful they would turn out to be. 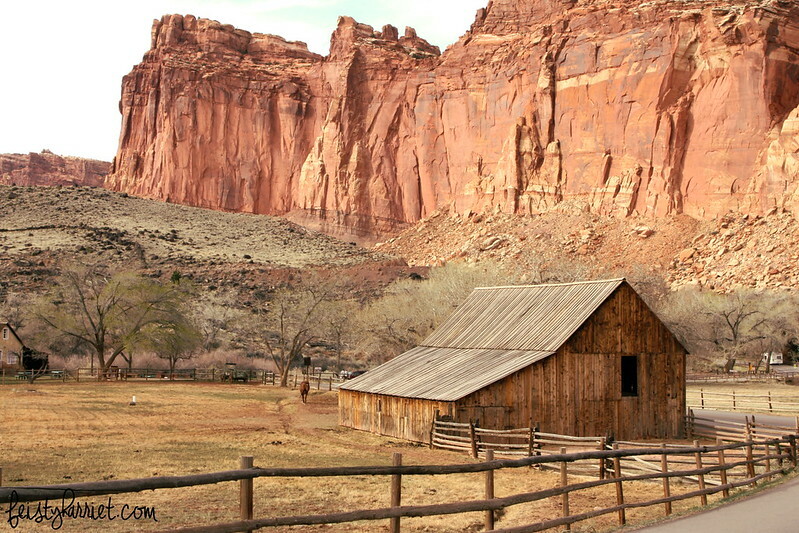 Mormon pioneers settled in Capitol Reef about 150 years ago, and they planted hundreds of fruit trees which in addition to a few houses and a school are all that remain. 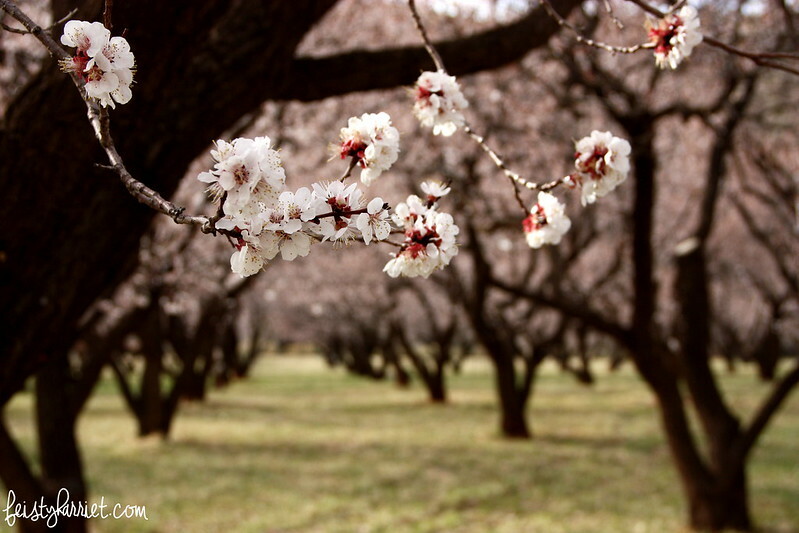 The park rangers cultivate the trees and sell the fruit by the bushel or in overpriced fruit pies, and that is all fine and good, but in researching this park what I most wanted was to happen to be there when the orchards were in bloom. 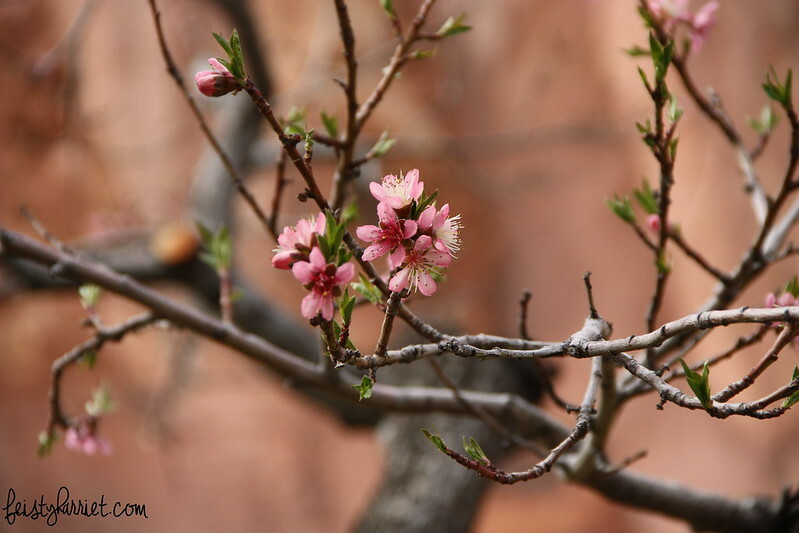 The image of rows of trees smothered in creamy pink blossoms sitting like a candied cloud at the base of towering red rock cliffs has been haunting my dreams for months. When I found myself kind of in the area (meaning, if I drove 130 miles out of my way I would be “in the area”) I was immediately stunned by the gorgeous cliffs striped with red and orange, black and purple, creamy white and green. There are a few small stands of trees along the road through the park, I stopped at took pictures at all of them but was a little disappointed that most were just starting to bud and not yet in full bloom. I stopped at the Visitor Center to inquire if there were additional orchards, where they were, and if any of them were current in blossom. 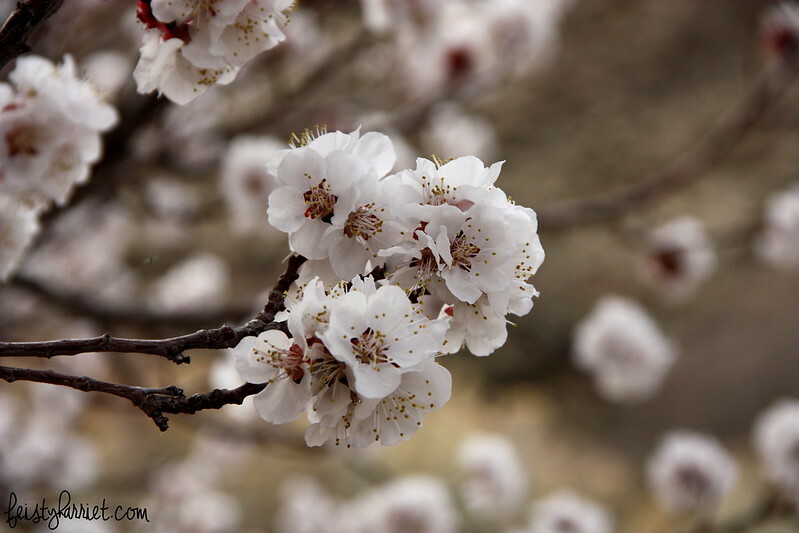 The ranger gave me directions to the upper campground, located on Loop C, and told me a grove of 200 apricot trees were in full bloom a day or two before and he hadn’t been back since. I thanked him and headed that way, desperately hoping that there would still be a few petals on the trees. 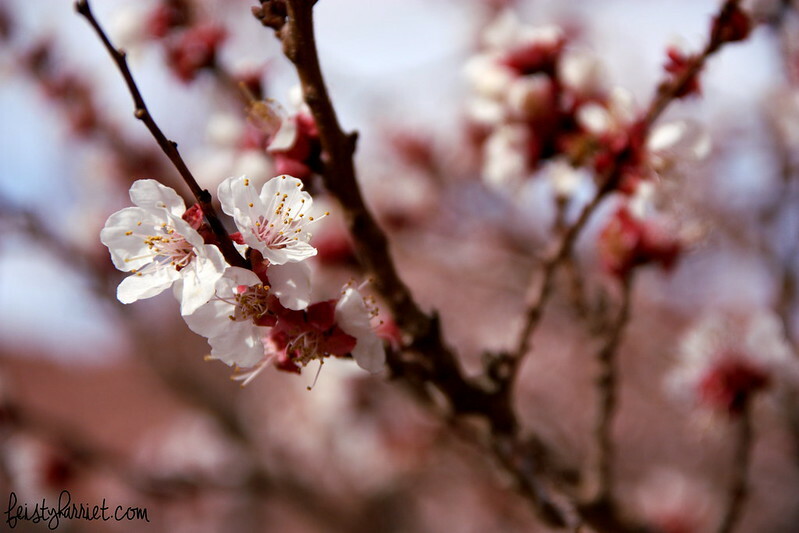 I rounded a curve and was gobsmacked by rows and rows of trees just losing their white blossoms; I parked my car and as soon as I opened the door I could smell the sweet perfume from these trees and hear the bees. Kids were scampering through the orchard, a couple of people were having a picnic, some guy was taking a nap leaning against a trunk; it was magical. I wish I had driven through the day before, many of the trees were gray-ish pink and has lost most of their white flowers, but I still walked through that orchard for almost two hours just reveling in the spring, the blossoms, the intoxicating aroma, and the red sandstone cliffs soaring overhead. I need to go back to Capitol Reef, not only to explore a little more and do some hiking, but hopefully to spend a few nights in the campground adjacent to the apricot orchard. Honestly, this is the kind of place made of the stuff of dreams.